For those who, like me until recently, weren't in the know about this fabulous dessert, let me enlighten you: pavlova, a New Zealand creation dating back to the 1920s, is a meringue based dessert named for the Russian ballet dancer of the same name, Anna Pavlova. Crisp-on-the-outside, pillowy-soft-on-the-inside meringue discs, topped off with whipped cream (or Chantilly cream or ganache or mascarpone...) and topped with fresh fruit (or compote or toasted nuts or crème anglaise...) to create a decadently delicious dessert that is naturally gluten free and impossible to ignore. Happy baking! 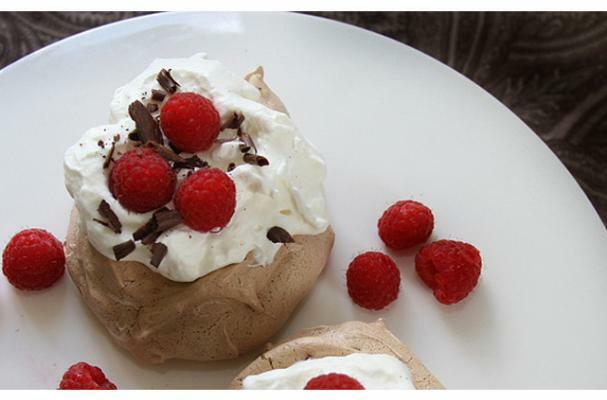 If you have any trouble with these (or any) pavlova recipes, the Daring Bakers Pavlova Challenge is a great resource, including photos, videos and tons of variations! If you aren't sold on this recipe by now, think of breaking through the crisp meringue shell, savoring the marshmallowy center topped off with earthy nutmeg whipped cream and sweet-tart cranberries. You'd better be drooling. From the Daring Bakers Challenge - a simply decadent dessert. Rich chocolate meringue topped off with a lick-the-bowl-clean chocolate sour cream frosting and toasted nuts. Heaven on a plate. Sweet fresh figs, spicy-sweet ginger syrup and crunchy pistachios on a bed of pillow meringue - perfection? I think so.